richard has studied interior design, photography and film. he first worked in the theatre and the visual arts (light-/sounddesigner, assistant curator and artist). later he moved to filmmaking. first as a production designer, later key grip, 1AC and finally DP. he' s based in belgium and works as a cinematographer since the mid-nineties, has shot over 30 featurefilms; usually european co-productions, both arthouse and mainstream. his breakthrough came with the multi award-winning ROSIE (Toronto, Berlinale,...). amongst others he's shot films such as ; SPIDER IN THE WEB (starring ben kingsley, monica bellucci), DREAMLAND (starring stephen mchattie, juliette lewis, henry rollins), LOVE & FRIENDSHIP (starring kate beckinsale, chloe sevigny, stephen fry), LITTLE BLACK SPIDERS (afi fest), A FAREWELL TO FOOLS (starring gerard depardieu, harvey keitel), NOWHERE MAN (venice days), WOLFSBERGEN (forum berlinale) and GUERNSEY (director's fortnight cannes). he also shoots TV-fiction such as MADAM MINISTER and WALTZ (both top ten fiction cologne-D). richard worked on a large number of award-winning projects, selected for the main filmfestivals worldwide. twice he won the dutch national award for best cinematography. with a pronounced cinematographic style he shows great respect for acting. without being artificial or arrogant, he can transform the ordinary into the unique. he is mainly influenced by the thoughts of R.BRESSON and the works of M.ANTONIONI. one could describe his work as poetic and powerfull. richard van oosterhout is president of the NSC (netherlands society of cinematographers), member of the SBC (belgian society of cinematographers) and the EFA (european film academy) . 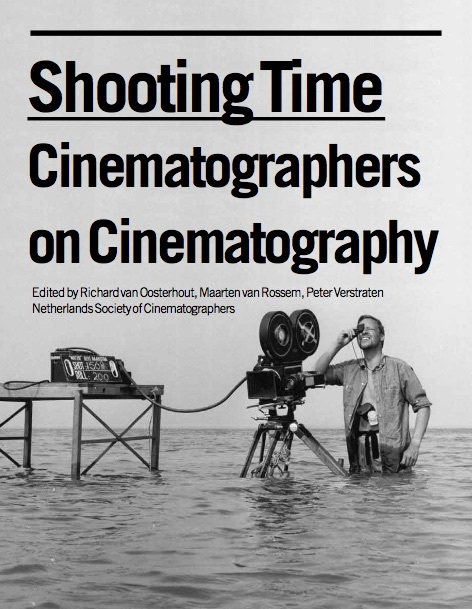 SHOOTING TIME contains a collection of conversations with directors of photography from all over the world who talk about their profession in the era of the transition from analog to digital cinema. the conversations center around two main areas: film language and digital revolution. how does each and every DP employ his own visual style or film language ? and in addition to that, how do the DP'ss relate to the cinematography of previous decades? who were their preeminent influences? as regards the turn to the digital, do the new tools transform the profession of DP's? for better or for worse? moreover, do the hypermodern cameras affect the language and visual outlook of the cinema? if so, how? the interviews with the cinematographers are preceded by four articles: on the history of film styles; on shooting a documentary; on the importance of being digital savvy, and one advocates the enduring relevance of celluloid. © 2016 Richard Van Oosterhout, All Rights Reserved.